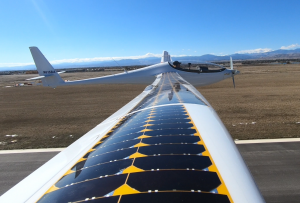 DENVER, Colorado – October 29, 2018 – Several additional test flights of the “StratoAirNet” solar electric technology demonstrator prototype for Bye Aerospace’s family of medium-altitude aircraft systems took place Oct. 15-17 at Northern Colorado Regional Airport. The prototype made six short flights, with further data collected on take-off and landing performance, climb rate, aero-efficiency and motor and battery operations. Airborne motor cruise efficiency and solar cell energy collection data will be the focus of the next series of flight tests. The StratoAirNet prototype’s first flight took place in mid-August 2018. Both the StratoAirNet and “Solesa” aircraft systems are intended to provide support for long-endurance commercial and government security requirements, including patrol, observation, utility, mapping, precision agriculture, search and rescue and surveillance missions. Advantages over traditional systems include lower unit cost, lower heat and noise signatures, lower operating costs and enhanced utility. The Solesa aircraft system will be piloted, performing similar patrol and survey missions for shorter flight durations. It also provides an R&D test platform for new customer payloads. StratoAirNet is intended to be a longer-endurance UAV and will follow required steps to qualify this additional capability. Bye Aerospace, an innovator of sophisticated aerospace technology, is developing the “Sun Flyer” family of all-electric aircraft in addition to a family of advanced, medium and high-altitude, long-endurance solar-electric aircraft called “StratoAirNet” and “Solesa.” The company was named the 2018 Small Business of the Year in the “small business” category by the Denver Business Journal. For more information, go to www.ByeAerospace.com.